Blue Allen Training Stables, in Alamosa, CO, is located on 160 acres of flat ranchland in the San Luis Valley of southern Colorado, created by the Sangre De Cristo Mountains on one side and the San Juans on the other. While still a typical small western town in many respects, Alamosa features many busy tourist attractions including the Great Sand Dunes and the Rio Grande Scenic Railroad. Blue's facility includes a 165' x 265' outdoor arena, plus a 120' x 120' cutting pen – and there are always cattle on hand to work. Stalls and large outdoor pens offer accommodations for up to 50 horses: horses in training, boarder,s and those who bring horses through for a few days or weeks of training with Blue. 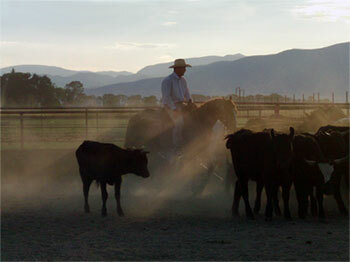 Although there is substantial groundwater under Alamosa, ideal for watering horses and cattle as well as growing excellent hay, the summer weather is dry with mild temperatures and the occasional afternoon rainstorm, and cool comfortable evenings. Paradise is a bit short-lived, however, when freezing cold winters blow in around early December. Then it's time to move to an indoor arena down the road. Many clients come to stay for a few days, bringing their trailers and plugging into hook ups in the expansive driveway. There are also a number of motels in the area.